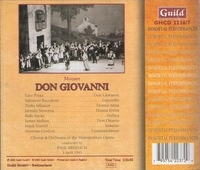 "To cap the 1943 performance [above], we have Milanov's only broadcast of a Mozart role. Its uniqueness lies not only in its rarity....her discovery of her dead father is a heartrending, gripping episode. Will she ever again be so passionately involved, so varied in vocal and dramatic effects, now flashing out, now retreating into sorrowful diminuendi, the vocal color astonishingly rich? She even faints convincingly. The thrill of her vocalism is undeniable. She spins great webs of silvery tone as she enters in the finale; her control is sure, the tone ravishing in the mask trio with the top voice well focused, her scales perfectly realized. The voice is well knit throughout its entire range and at all dynamic levels. She takes the first phrase of 'Non mi dir' in one breath; the turns are excellent and executed in a silky legato. When Anna first enters, Milanov, in her excitability, occasionally overshoots the mark vocally, but her discovery of her dead father is a heartrending, gripping episode. Will she ever again be so passionately involved, so varied in vocal and dramatic effects, now flashing out, now retreating into sorrowful diminuendi, the vocal color astonishingly rich?....the thrill of her vocalism is undeniable. She spins great webs of silvery tone as she enters in the finale; her control is secure, the tone ravishing in the mask trio with the top voice well focused, her scales perfectly realized. The voice is well knit throughout its entire range and at all dynamic levels....the turns are excellent and executed in a silky legato."